adjustable to fit your vehicle. - Truck Rack weight: 129 lbs. - Weight capacity: 800 lbs. - Van Rack weight: 44 lbs. 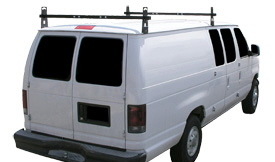 Call now to see for yourself how inexpensive these high quality truck and van racks are. 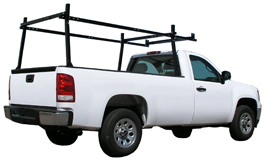 These Econo Steel Truck Racks and Econo Steel Van Racks Can Be Shipped UPS! Copyright© 2011, Hauler Racks, Inc.® All Rights Reserved.